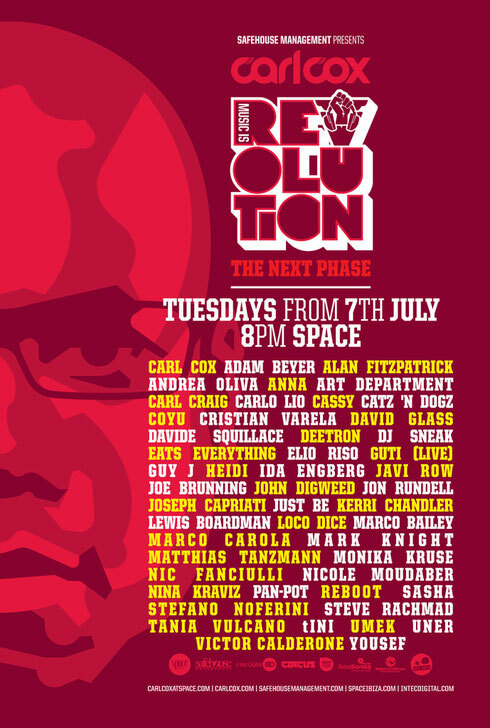 Carl Cox and Safehouse Management complete their line-up with the recent final announcement of who’s playing the last four weeks of Music Is Revolution – The Next Phase. Joining the line-up for the final weeks are: 1 September - Adam Beyer, Carl Craig and another appearance from Yousef in the main room, whilst John Digweed, Reboot and Victor Calderone look after the covered terrace. 8 September sees Nina Kraviz and Carlo Lio join Carl in the Discoteca, with Marco Carola, Guy J and Elio Riso on the terrace. 15 September’s main room is Carl, Pan-Pot and Intec’s Jon Rundell and Circus take over the terrace with sets from Bristol bass music maestro Eats Everything, Yousef and David Glass. And finally the closing party on 22 September, ending the season in style with Carl, Loco Dice and tINI and on the terrace, DJ Sneak, Monika Kruse and Just Be. These final additions join a whole host of names already confirmed for the season. In the main room there’s Marco Bailey, Joseph Capriati, Marco Carola, Berghain resident Cassy, Deetron, Argentina’s Guti (Live), Heidi, Nicole Moudaber, Steve Rachmad, Davide Squillace, Matthias Tanzmann and DC 10 favourite Tania Vulcano. Whilst on the terrace across the season there’s MadTech’s label-head Kerri Chandler, Anna, Canada’s illustrious Art Department, Lewis Boardman, Joe Brunning plus Catz ’N Dogz, Nic Fanciulli, Alan Fitzpatrick, , David Glass, Mark Knight, Stefano Noferini, Andrea Oliva, the legendary Sasha, Uner, Umek and Suara Record’s Coyu going b2b and Cristian Varela. Safehouse have also confirmed that for the first time, they’ll be working with Reach Up and Electronique alongside Digital Groove who will all be hosting nights in the El Salon throughout the season. There’s also After Dark with Mr Doris presenting various nights on the Sunset Terrace and hosts of the Premier Etage will include Awaken Ibiza and Clara Da Costa Presents Jacks House (who’s guests across three dates will be Francesco Robustelli, Hanfry Martinez & Alex Arnout). Furthermore, carrying on the collaboration from last year, Ibiza Sonica Radio will be broadcasting live from the Sunset Terrace, with some of the headline DJs playing special sets earlier in the night, all kicking off from 21:00. Already confirmed: Carl Cox, Umek & Yousef.